In Arizona, gardeners in the low deserts around Phoenix and Tuscon successfully grow peach trees only if they select those with low winter chill requirements. 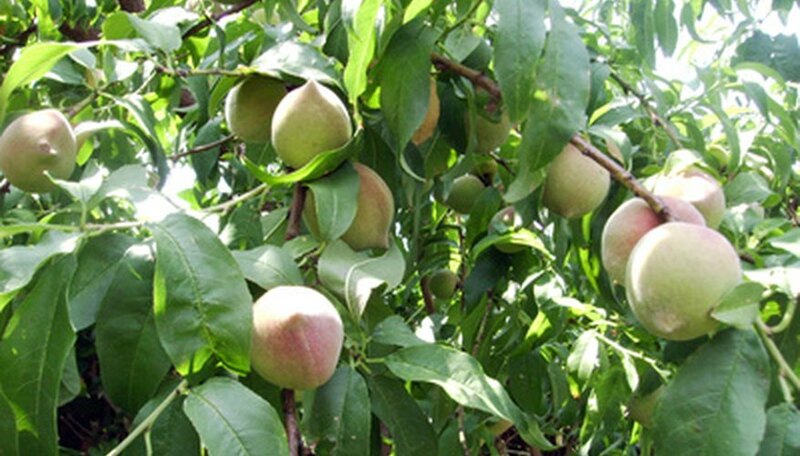 Higher elevations, such as Prescott and Flagstaff, have greater leeway when selecting peach varieties, but may have late frosts. 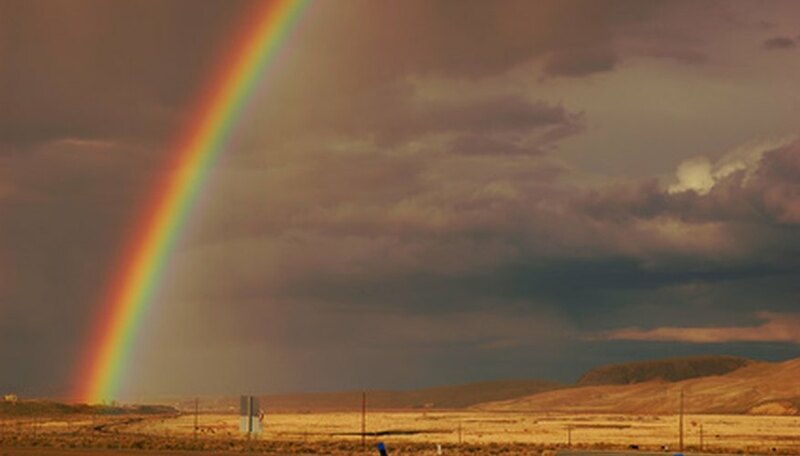 Arizona also throws strong sun, monsoon rains and alkaline soil at peach trees. 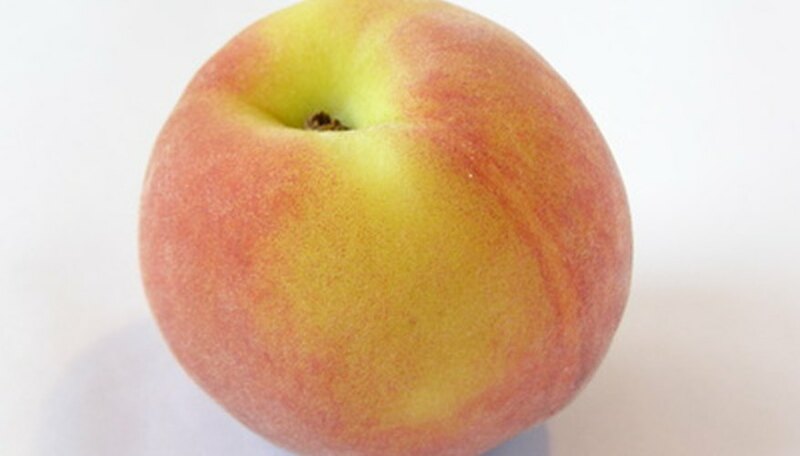 With a little knowledge, however, you can grow juicy peaches nearly anywhere in the state. Select a location in full sun or in an area with partial afternoon shade, avoiding heat-reflecting surfaces and underground pipelines. Dig an 8-inch wide hole roughly 2 ½ to 3 feet deep. Fill the hole with water. If water remains in the hole after two days, the site has poor drainage; select another location. Choose a peach tree variety with appropriate winter chill requirements. 'Desert Gold' only needs 250 hours of winter chill, and 'Florida Prince' requires a mere 150. Higher elevations, with cold winters, may select many other varieties, including 'Elberta' or 'Red Globe.' These two varieties need 800 hours of winter chill. Buy the tree from a reputable nursery, and select a young tree, 4 to 5 feet tall. Older trees establish slowly, and become easily stressed in summer heat. When planting peaches, dig a hole no deeper than the soil in the tree's container, but twice as wide. Look for layers of caliche, a pale, crumbling soil high in calcium carbonate. If the caliche is in a solid layer, you must break it to allow for root growth and adequate drainage. Plant the tree according to the nursery's directions. 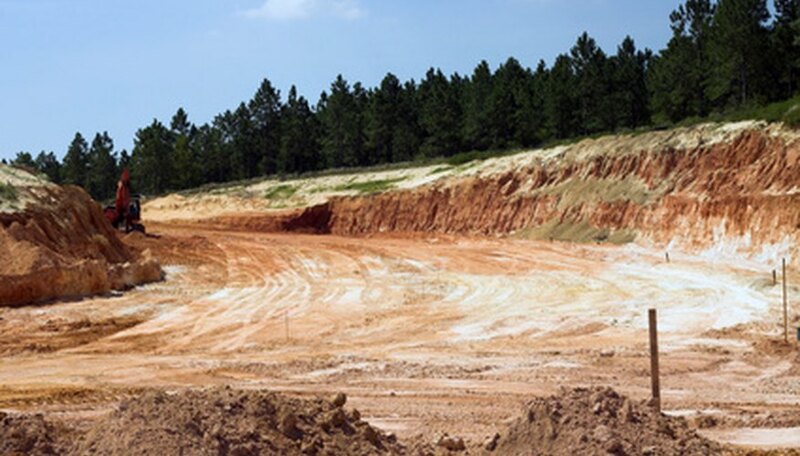 The North Carolina Cooperative Extension warns against amending average soils, as the roots remain in the enriched soil and eventually girdle the tree. 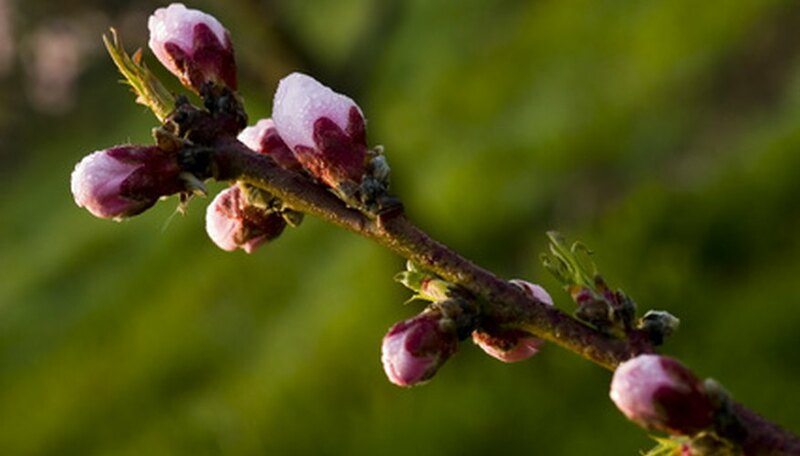 Fertilize Arizona peach trees before the buds open in spring, beginning the second year after the tree is planted. Arizona soils generally have enough potassium and phosphorous to support healthy growth, but nitrogen, the first number in fertilizer formulations such as 10-10-10, is often lacking. Add 1/10 to 1 lb. of nitrogen per inch of trunk diameter, suggests the Arizona Master Gardener Manual. Watch for iron or zinc deficiencies. Highly alkaline soils, especially those with caliche present, inhibit the peach tree's ability to take up these two nutrients, according to the “Sunset Western Garden Book.” Iron-deficient trees have light-green or yellow leaves with green veins. Zinc-deficient trees produce narrow leaves in clusters at the end of young branches. Spray iron sulfate or iron chelate onto the leaves of iron-deficient trees. Use zinc chelate, never zinc sulfate, to correct zinc deficiencies. Always follow the manufacturer's directions, as the trees may need several applications. Monsoon rains may contribute to root rot in poorly draining soil. Rains may not be heavy every year, so select a location with good drainage. Do not water trees heavily in the spring, as this contributes to iron deficiencies. Arizona has very low humidity most of the year. Soak bare-root trees or neglected nursery stock for 24 hours before planting to rehydrate dessicated plants, and spread at least 3 inches of mulch around peach trees, keeping the mulch 1 inch from the trunk. Arizona's intense sun burns fruit and may injure leaves and bark of low-desert trees. When selecting a site for a peach tree, consider areas where the tree receives scattered afternoon shade. Many gardeners paint fruit tree trunks white to reflect the heat and prevent uneven bark growth.